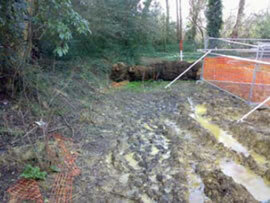 This photo shows the poor state of the ground conditions following a clearance operation, undertaken before protective fencing was installed. However, it is an unfortunate fact that despite their best efforts many arboriculturists regularly find themselves dealing with developers that have broken all the rules with regard to the protection of trees on their sites. ArborEcology are now tackling the job of alleviating compaction on development sites using a combination of TerraVent and Mulch incorporation using compressed air technology. The information below has been put together to show the different remediation techniques of soil de-compaction and improving soil structure. This case study is based around a site that was cleared of all its vegetation apart from the trees that were to be retained as part of planning consent. Nothing unusual there, but the site clearance operation was undertaken using machinery more associated with a commercial forestry site than with a small urban development. This method of clearance is becoming increasingly popular with developers, simply because it is a far cheaper and faster means to prepare a site for building to begin. The problems for this site began as soon as the existing vegetation was cleared, the lack of any root protection fencing installed on around the trees, meant that heavy machinery were able to rut and compact the soil inside the designated root protection areas (RPAs). The final phase of the clearance used a machine which mulched any of the remaining material left on the ground, and this included the top layer of feeding roots of the trees to be retained. Healthy soils contain five basic components; oxygen, organic matter, mineral matter, living organisms and moisture. A Soil’s porosity allows water to drain through, carbon dioxide to escape and oxygen to enter. Large machines operating on exposed soils, particularly in wet conditions, compact soil pores and prevent these processes from occurring. The first part of the alleviation process employs the use of a TerraVent. This works by driving a hollow metal probe into the ground and releasing a jet of high pressure Nitrogen gas. This gas shatters any hard packed layers or pans within the soil and allows any surface water that may have gathered on the surface to drain freely. This first step of the re-structuring process allows oxygen down to the layers and encourages living organisms such as bacteria to re-colonise the soil. A liquid humate material can also be injected at the same time to improve soil structure post de-compaction. Where compaction is broad spread and soil structure has been affected to such an extent that drainage is affected the TerraVent is used primarily to drain the surface water from the site. The next stage in the remediation process is to help rebuild the soil structure by incorporation of organic matter. Firstly this provides a food source for organisms such as earth worms and beneficial fungi, subsequently becoming absorbed by the trees. The combination of earthworms and fungi help to break down the organic matter into a form that can be taken up by tree roots. Meanwhile, earthworms also incorporate the bulkier material into the soil and this helps to keep soil pores open maintaining good soil porosity. Organic material helps to retain water in the soil. This is vitally important particularly on development sites where the natural water tables may be severally disrupted by deep excavations and earth moving. Finally when organic matter is applied in a thick layer or mulch to the surface of the soil it absorbs the affect of pedestrian traffic and helps to prevent compaction within the RPA of the trees post development stage. Types of organic material, there are several types that are available including farmyard manure, peat, leaf litter, composted woodchip, bark and compost. However for the specific use around trees it is recommended that only low nutrient, neutral pH and properly composted materials should be used. This photo shows an Airknife being used to incorporate wood chip into the top 150mm of soil Using high nutrient mulches such as farmyard manure can support diseases such as Phytothera and enhance their ability to colonise trees, already stressed by development. These types of mulches may also encourage weeds to grow and compete with the trees for available nutrients. 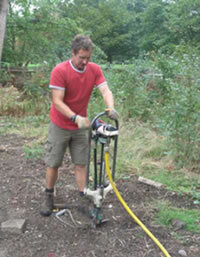 Materials such as composted wood chip and composted leaf litter are ideal for the root zones of trees. These products provide low nutrient mulch and in the case of leaf litter provide compost that would normally be associated with the natural tree root environment. The most effective method of incorporating the mulch into the soil is through the use of an air lance, which uses compressed air to mix up the soil and organic matter. For shallow inclusion the mulch is spread on the surface of the soil and the directional compressed air is used to mix the top layer of soil with the mulch. This photo shows a trench being filled with composted woodchip.This method is used where there are minor compaction problems alongside footpaths or desire lines etc. For deeper de-compaction the compressed air lance is used in a similar manor to the TerraVent by punching holes up to a metre deep into the soil. These holes are then expanded in bore size and filled with mulch. This process is known as vertical mulching. Radial trenching is a means of incorporating mulch in larger volumes into the rooting zone of trees. 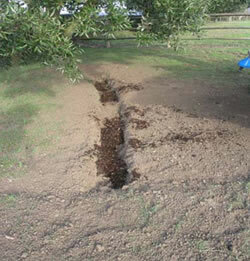 This process involves the excavation of trenches on a quarter of the trees RPA. This trench is then filled with mulch. Because this particular process is a lot more invasive to the trees root zone it is recommended that this process is carried out over a four year period doing a quarter of the trees RPA per year. By its very nature any organic matter will decompose and it is important to maintain a constant amount of organic material. 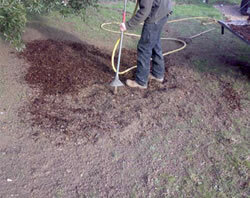 The most effective method is by maintaining a mulch layer at least 150mm deep on the surface. This layer will act as mat and reduce compaction from pedestrian traffic as well as trapping moisture in the top layer of the soil.